Coloro – the color revolution? – freieFarbe e.V. 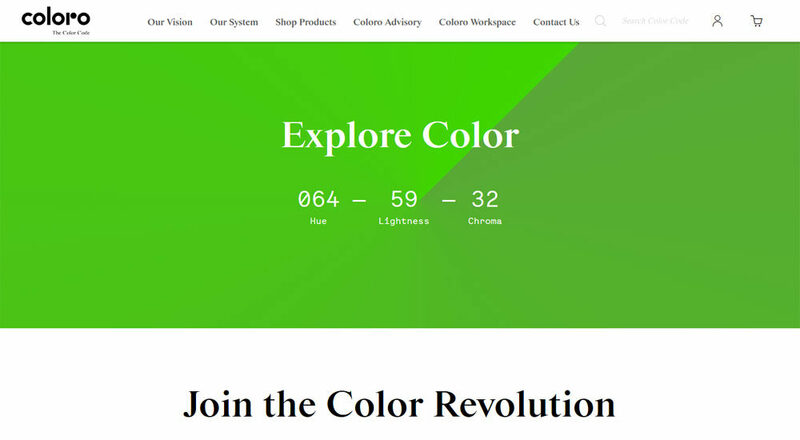 Coloro – the color revolution? CLR Code Limited, founded in 2017, is pursuing no less than this ambitious goal with its new “Coloro” colour system. CLR Code Ltd. was registered in London in 2017 with a share capital of 100,000 EUR, an office is also operated there, there is also a Chinese representation, but the business is mainly conducted in an industrial area in Overath near Cologne. The CLR Code Limited is backed by two heads known in the paint industry: Detlev Pross once headed the Pantone European headquarters in Karlsruhe. Thorsten Traugott held management positions at one of the leading trend research institutes: Worth Global Style Network (WGSN), which is part of the media company’s network Ascential. The international ambitions of CLR Code Ltd. can also be seen in the fact that the website exists only in English. The software for Coloro does not exist for Windows, Macintosh, Android or iOS, but is a web application implemented directly on the website. In order to use it, you have to register, this is free and fast. In large input areas, each of the 3500 colors can be set by dragging the mouse. There is a web color atlas that displays the colors in a systematic way and in which you can put together your own color sets. A further window shows the Coloro color tones closest to a default color. You can calculate color harmonies in the application and even a 3D representation of the system is implemented on the website. For all colors, the surface also shows the corresponding sRGB color values and the Lab color values. The largest colour book is the so-called “Toolbox”. This slipcase consists of 63 folders with 3500 removable plastic color samples of the size 5x5cm. It costs 5995 EUR. The “Codebook” is a ring binder colour atlas in which the 3500 colour tones are systematically glued according to the HLC-3D model, it costs 895 EUR. The “Lookbook” is a smaller ring binder. It has approx. A4 format and shows the 3500 plastic shades in 1.5×1.5cm in consecutive order. The price is amazingly low with 395 EUR. Besides the plastic color samples are offered also individually in 10x10cm and 5x5cm. .. is one of the first sentences on the website. However, this freedom is limited to the 3500 given colour tones, intermediate levels are not calculated or displayed. Coloro can only be compared to other color systems and collections via lab values. It is permitted to use and save the colour tones on a workstation. On the other hand, there are numerous “You may not” points, including, for example, the transfer of colour information or the creation of a colour database with the colour tones. 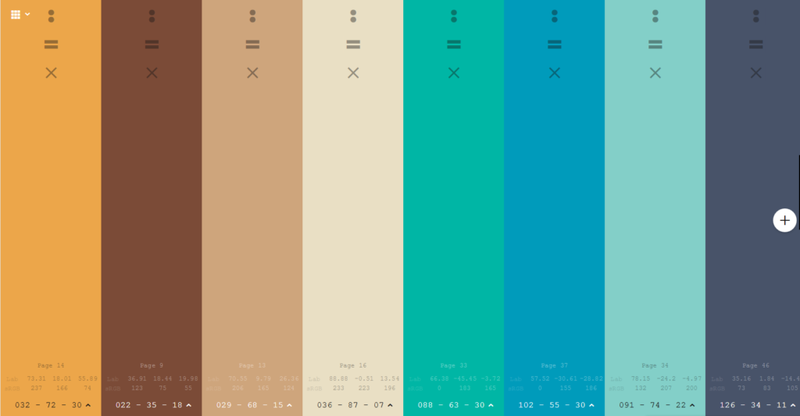 Hue/Lightness/Chroma coordinates are displayed in the color names of the Coloro colors. The above screenshot color 064 59 32 is given as Hue 64, Lightness 59 and Chroma 32. This classification according to hue, brightness, saturation corresponds to our perception – in this respect Coloro takes a very sensible path. However, the Coloro-Hue/Lightness/Chroma does not correspond to the Hue/Lightness/Chroma of the CIELAB model (HLC or LCh), which was introduced in 1976 and is now used worldwide. In the above example, a CIELAB-L of 61.64 is given for the Coloro-L of 59, for example. How the conversion into the CIELAB color values works remains hidden. While the CILEAB colour values are still given for the 3,500 colour shades, this is not the case for intermediate levels. Free conversion into other color spaces (RGB/CMYK), which every computer can handle via color management, or color system comparisons, which usually take place via the Lab color values, are therefore only possible for the 3500 specified color shades of the Coloro collection. The term “Hue/Lightness/Chroma” and its abbreviation “HLC” are common today for the CIELAB model, but not protected for it, therefore the procedure is not legally objectionable. However, HLC confusion is inevitable, e.g. with our HLC Colour Atlas, the HLC compartments, with the RAL Design System and numerous other applications. It would be easier and freer for all sides, Coloro would have set on the usual CIELAB-Hue/Lightness/Chroma. This would have only one disadvantage: since CIELAB is not protectable as a purely mathematical model, the above-mentioned restrictive license model would not have been possible. Coloro is a manufacturer’s color collection that is sensibly sorted according to hue, brightness and saturation. The announced “freedom” is to be seen critically: the system is non-free on the one hand by self-imposed restriction to fixed colors, on the other hand by restrictive license conditions, the second requires the first. The question arises, from Coloro on, despite the “20 years of scientific research” due to the use of the good old Munsell system, is rather “old wine in new tubes” than a colour revolution? Some functions and ideas also remind the author of joint meetings and of the Digital Color Atlas. We will see to what extent the revolution can be realized with Coloro. What speaks for it: often it is not the best quality that prevails, especially in the field of color, this can be seen in many cases, the players are well-known and have been in the “big business” for a long time – so it remains exciting. Is Coloro the biggest challenge to Pantone’s dominance of the color market? The opinion of the author does not necessarily reflect the opinion of all members of the fF team.